You saw the first of our take-a-baby-bed-apart-and-see-what-you-can-do-with-it projects - the trellis made from the crib's springs. Engineer has a very gracious soul. Although he goes along with my cockamamie plans, he is never sure how they are going to work out. And this project got more complicated the further we got into it. Let me preface by saying that neither he nor I are designers, artists, electricians, or have any other useful skills that would have made this project as smooth as buhddah. Our front porch only has a motion sensitive light which would be okay if it would stay on, but it doesn't, which is annoying. I wanted a front porch light. We needed a front porch light. And now we have a front porch light. 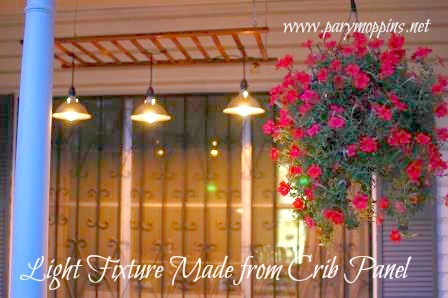 I knew that I wanted to make a light fixture out of the side panel from the crib but I had no idea how to do it. Engineer and I wandered around Lowe's for hours modifying our design plan multiple times. Finally we settled on a mixture of pre-fab and repurposed items to make the end product. Please note that when I say we, I mean the Royal we, meaning Engineer did this one all on his own. 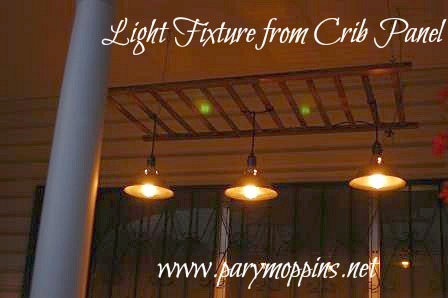 Our main areas of concern were what to use for the actual lighting element, what to use as a cluster body (the box where all of the electrical wires are hidden) and how to hang the crib panel from the porch ceiling. Originally, we wanted to go s-u-p-e-r rustic and use mason jars for the lighting elements with possibly using inverted stovetop burner drip pans to reflect the light downward (cute right?) But as per our three hour tour of Lowe's would prove, that wasn't possible for us at that moment. Lowe's was out of plain sockets. Bummer. We had to rejig our plans. Twice. We were about to give up altogether when I walked down the aisle of construction lighting and found shop lights. They were cheap. They already had a shade and a light kit. They were perfect. A baby food jar was used as the cluster body so all that was left was the way to attach it to the ceiling. Engineer drilled pilot holes in each leg of the panel and screwed eye screws in each hole. He then cut the cable with a drimmel to the desired length. He threaded the cable through the eye screw and bent it around using cable clamps to keep it in a loop on one end and through the turnbuckle on the other end so he could level the project. To make a cluster body, Engineer drilled a hole in the top of the baby food jar's lid and placed a grommet over the hole before running the wire through. It is water resistant, not water tight, but its position on our porch doesn't necessarily need for it to be water tight. We decided how far down we wanted the lamps to hang from the ceiling and from the panel. Engineer ran the three existing wires from the shop lights to one corner of the crib using cable guides nailed to the slats to minimize the wires' visibility. After cutting the wires to appropriate lengths, he used alligator clips to attach the positive and negative wires from each existing wire to one 16 gauge wire then wired a plug to the other end with an inline switch somewhere in the middle. Four pilot holes were drilled in the soffit and four eyes screws were screwed into the holes. The fixture was then hung from the eyes using the hook end of the turnbuckles. The wire was then run across the soffit and down the corner to the plug. 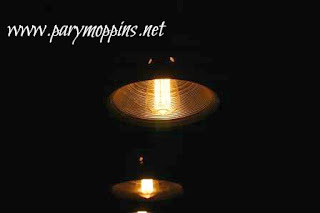 Edison bulbs were used as the lighting element because they look so darn cool. *Please note that Engineer's Dad is an electrical engineer so we felt confident that Engineer could handle this small project and if he couldn't that he could call his Dad for help. Please, please, please be careful when working with electricity. Make at your own risk. Having a porch light Works for Me. Thanks so much Ms. Nina, to you as well!